Having scored in all but two Championship games this season, Bournemouth are certainly an entertaining side. 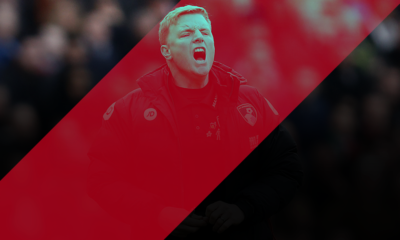 Eddie Howe has instilled an attractive, yet efficient style in his team, which has seen them score a massive 55 goals already this season, more than any other club in the Championship. 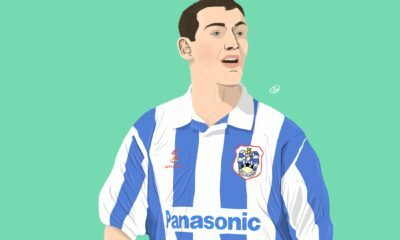 Luke Keattch documents a tactical study of the Cherries and uses the game against Blackpool as a reference for this article. Bournemouth have certainly come a long way in the past few years. Rewind to the 2008-2009 season, struggling in League 2, The Cherries were given a 17 point deduction for going into administration, the then manager, Kevin Bond, was sacked 4 games into the season and his successor, Jimmy Quinn, was gone by the New Year. In stepped Eddie Howe for his first spell in charge of the club. That season, he kept them in League 2 before eventually, on the last day of the following season, getting them promoted. Even with a transfer embargo and only 19 players on the books, Bournemouth finished 2nd and marched into League 1. 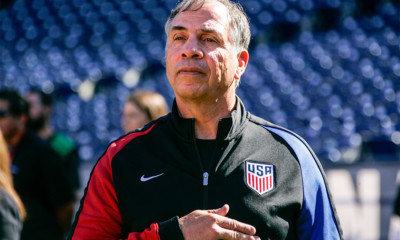 Eddie left in January 2011 to join Burnley before swiftly returning to the helm in October 2012. After an heroic play-off loss in 2011, the team from the South Coast of England have only ascended. They now sit top of the tree in the Sky Bet Championship. 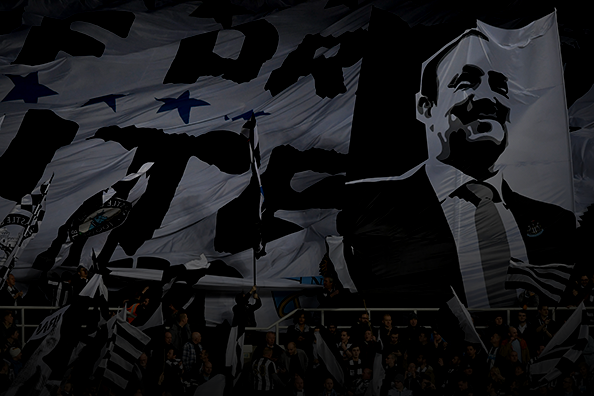 Can they keep this form up until the end of the season to reach the promised land of the Premiership? Well, if they continue to play the same way, I have no doubt they will be there or thereabouts, come what may. 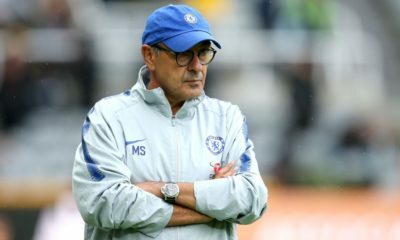 The season so far has not gone entirely to plan; a winless August and September has just gone to prove how good they have been in the closing months of 2014. With an average Goals per Game ratio this season, 2.25, they certainly know where the back of the net is. 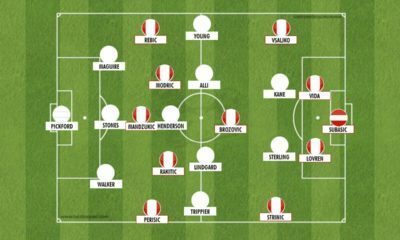 Immediately you can see how narrow the wingers, Marc Pugh and Matt Ritchie, are. 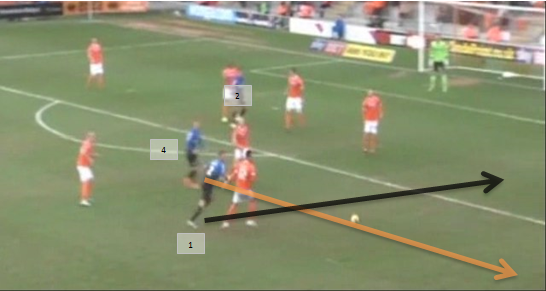 Additionally, the distance between the strikers, Brett Pitman and Callum Wilson is widespread. Pitman is a creative player, he comes deep to help keep possession, whereas Wilson uses his pace to try and find space in behind the opposition defence. 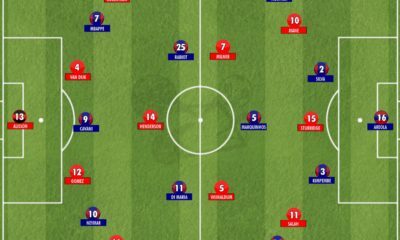 Andrew Surman, in centre midfield, sits further back than Harry Arter and acts as a pivot to allow Arter, Simon Francis and Charlie Daniels to play further forward. By combining these sets of movements, Bournemouth have 7 players in range of short passes to keep possession away from the opposition. 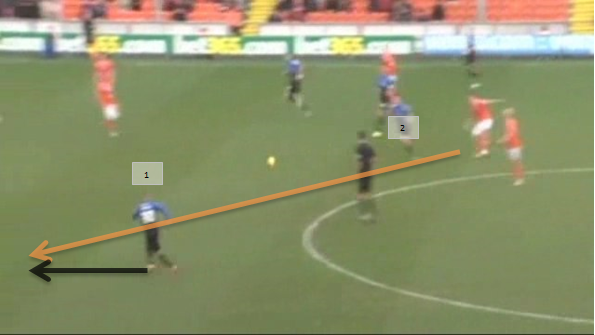 For the analysis from here on in, the black arrow lines indicate player movement and the orange arrow lines indicate the ball movement. 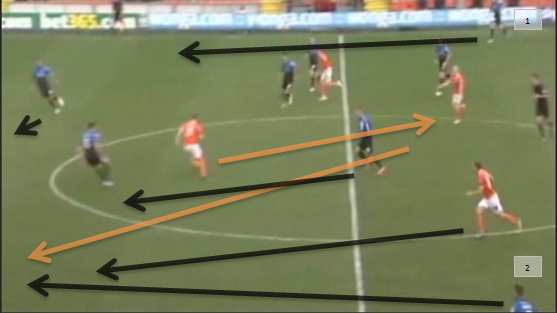 This section looks at the movement of Bournemouth’s left hand-side and how a narrow sitting winger causes mayhem in the Blackpool defensive third. 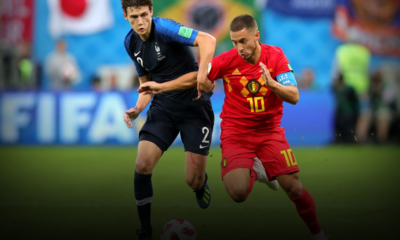 To confuse the opposition full back – should he follow the winger and allow the full back to come forward or stay out wide to cover the full backs run and let the winger drift in field? To get nearer to the deep lying forward Pitman (3) and advanced forward Wilson (4). 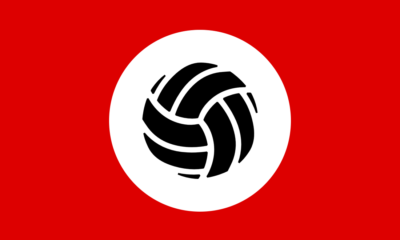 This will ultimately aid Bournemouth to keep possession of the ball. The following image is the subsequent part of the attack. Daniels (1) plays the ball into Pugh (2) who turns, runs, and plays the ball into the feet of Wilson (4), who has his back to goal. 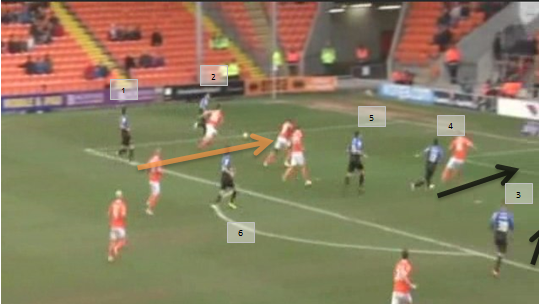 One of the Blackpool centre backs closes Wilson (4) which creates a gap between the two centre backs. 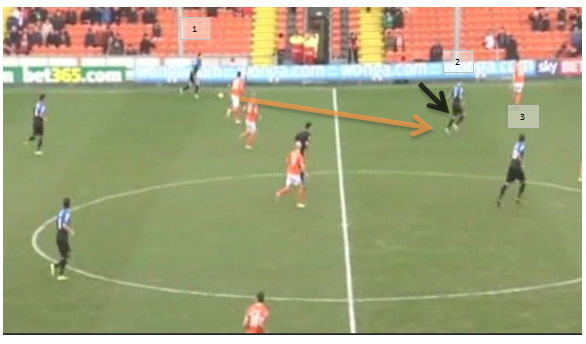 Left back Daniels, has continued his run down the flank to provide width and to give Blackpool more to ponder. Wilson (4) plays it back to Pugh (2) and turns to run into the space that has been created behind the advanced centre back. Pugh (2) passes to Pitman (3) who, first time, tries to play in Wilson (4). 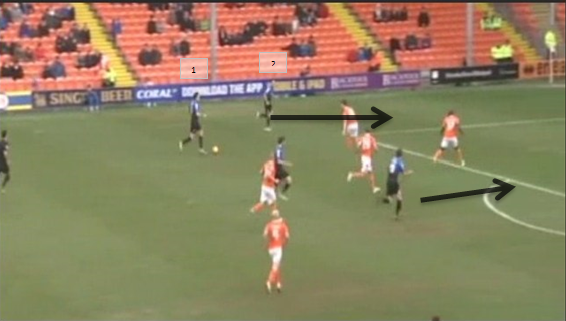 The attack fails, but instantly it is visible how having a winger slightly narrower and nearer to Pitman (3) causes issues for the backline of Blackpool. 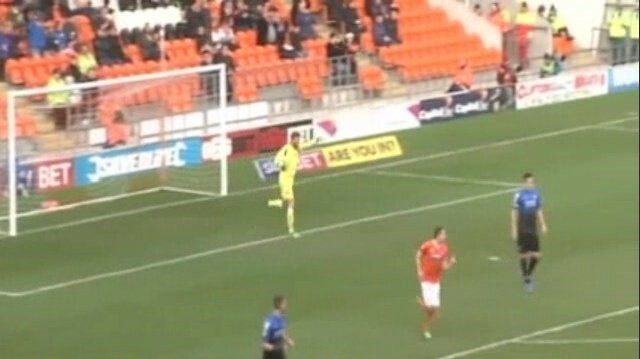 As Pitman (3) tries to play the ball through, the Blackpool centre back reads it well and intercepts. He then plays it into the Blackpool centre midfielder, who plays it to the Blackpool right back. Immediately, Pitman (3) and Wilson (4) run for the receiving full back. The Cherries frontline this to narrow the full backs options and to cause panic. Three Cherries players block the options for the full back. Pugh (2) blocks the pass to the centre backs, Wilson (4) blocks the pass into the centre midfielders with Pitman (3) blocking the ball down the line. 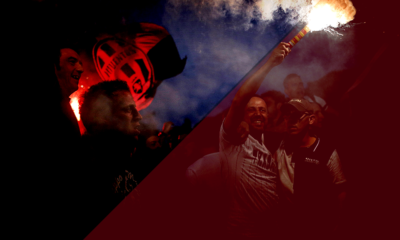 There is only one thing the full back can do – hoof and hope. This gives Bournemouth back possession. The position of Bournemouth’s midfield and full backs for opposition’s goal kicks helps to squeeze the space to retain possession. Bournemouth like to have possession of the ball and by these screenshots, Blackpool clearly don’t. When the Blackpool Keeper takes this kick, there are six Bournemouth players around where the keeper is going to kick it. The reason for this, is get any knockdowns and to be as close to the player receiving the ball as possible, to then close him down. Look how far the right winger, Ritchie (1) , is tucked in! Narrowing the field to narrow the options! With Ritchie (1) so far tucked in, it allows him, if Blackpool push possession to the left, to be able to intercept passes in the middle of the park. 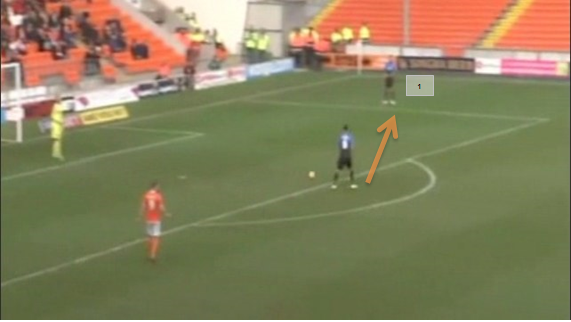 The next shot shows Ritchie (1) in position, anticipating the ball into the number 4 of Blackpool. 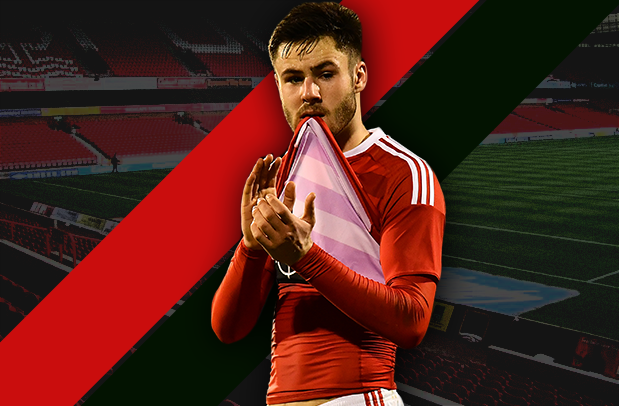 The ball goes to him, and Harry Arter (2) closes him down. 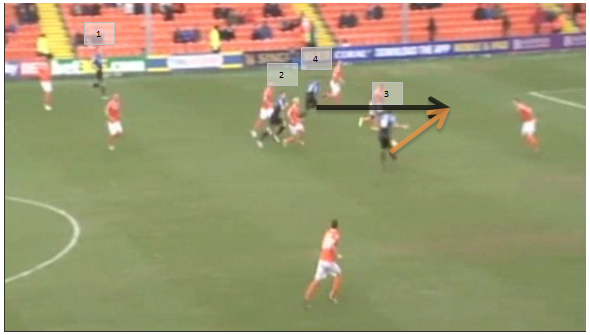 Once the ball goes to him, Ritchie (1) drops back anticipating the turn and pass from the Blackpool midfielder. The player turns and plays it to the left hand side, where Ritchie (1) is ready to sweep up. Blackpool has just had a tame effort at goal, which Boruc saves comfortably. Within a moment, Boruc is up, waving at the left-winger (Pugh) and the advanced forward Wilson to get up the field for the counter-attacking opportunity. Boruc then launches a kick towards that left-hand side. Additionally, you notice how the centre backs have split to provide Boruc an option if decides to play short. The kick does exactly want it was intended. It gets Blackpool running at their own goal and moves Bournemouth further up the pitch to start their pressing movements. The following image shows how the Bournemouth defence position themselves for Boruc’s kick; one to the left of the box, one to right of the box and one at the top. 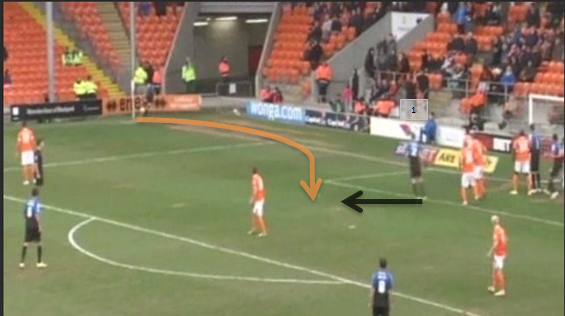 This short kick does two things; it keeps possession and draws Blackpool towards Bournemouth. 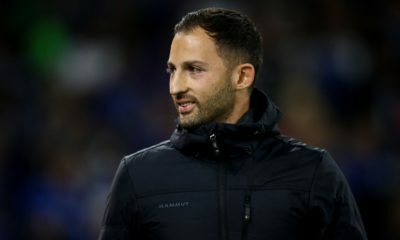 By drawing them towards their own goal, it means that they can either hit a long ball over the top of the Blackpool defence for Wilson or play the ball into Arter, Surman or Pitman to keep further possession. The opposite happens in this instance. Bournemouth knock it around nicely; Out to left back Daniels (1), who plays to Surman. 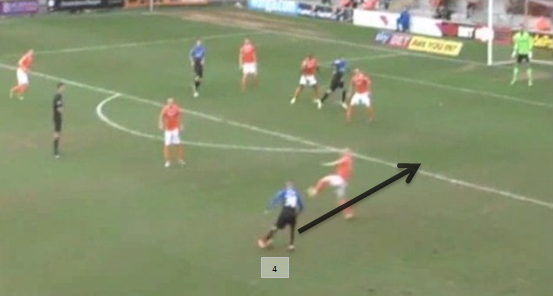 He then tries to find Pugh, who again is positioned narrowly, but Pugh loses it. The image below shows the high positioning of Daniels (1) and how quickly Bournemouth can get into trouble. Everyone now turns to go back and runs. The Full Backs (1 + 2) get very high when Surman gets on the ball. They know he can fire a ball across with precision. Luckily, the right back Francis (2) has the pace to intercept the ball out to this right hand side. If Pugh had not lost possession, Bournemouth would have been in a fantastic position to score with both wingers narrow and both full backs high. 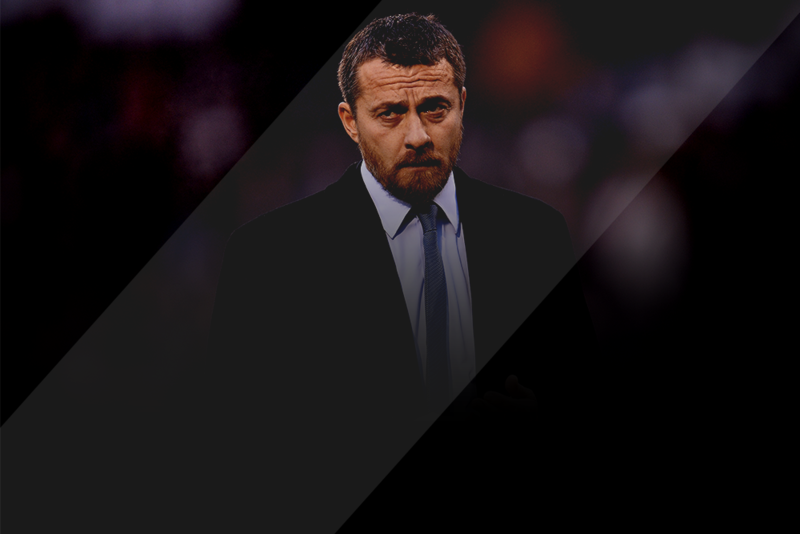 Bournemouth have to make sure that their full backs are capable of recovering in the scenario that they lose the ball. Failing to do so could result in unwanted consequences. Full Backs inside, wingers outside, in out, in out and shake the opposition up! We have already seen how high the full backs are willing to venture, now we can see what happens when they have possession so high. Daniels (1) is in the final third with the ball and Bournemouth have a 2 on 1 situation. The Blackpool right back can either close the ball down or follow the run of the winger, Pugh (2), who has drifted further left of Daniels (1). This is the exact reverse of when Pugh (2) had the ball at the top of this article. 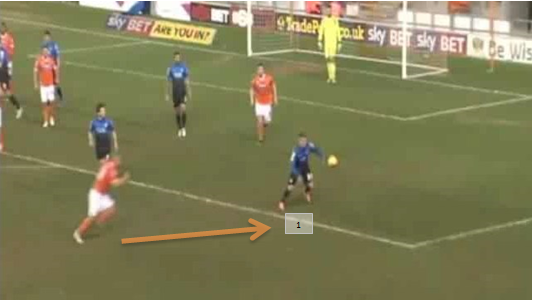 Daniels (1) plays the ball into Pugh (2) and then hangs on the corner of the box. Ritchie (3) arrives at the back post, Wilson (4) runs to the front post and Pitman (5) looks for the penalty spot. Arter (6) hangs back for any knockdown or tame clearances. He has a fantastic knack of scoring worldies! 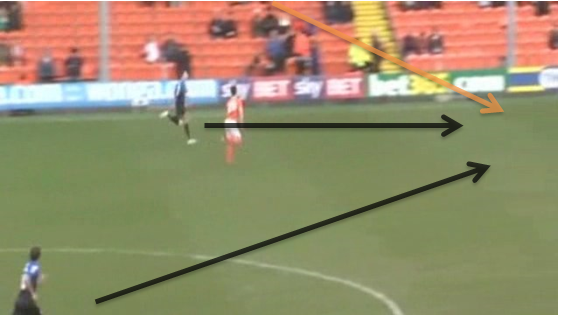 Bournemouth get a corner from this situation, as the Blackpool right back closes down the cross. That scenario shows how willing The Cherries are to get men into the box! Manipulating the Man-Markers to open up space. The Cherries put four men on the keeper, for their starting position, and purposely have no-one outside the 6 yard box and but still within the 18 yard box. 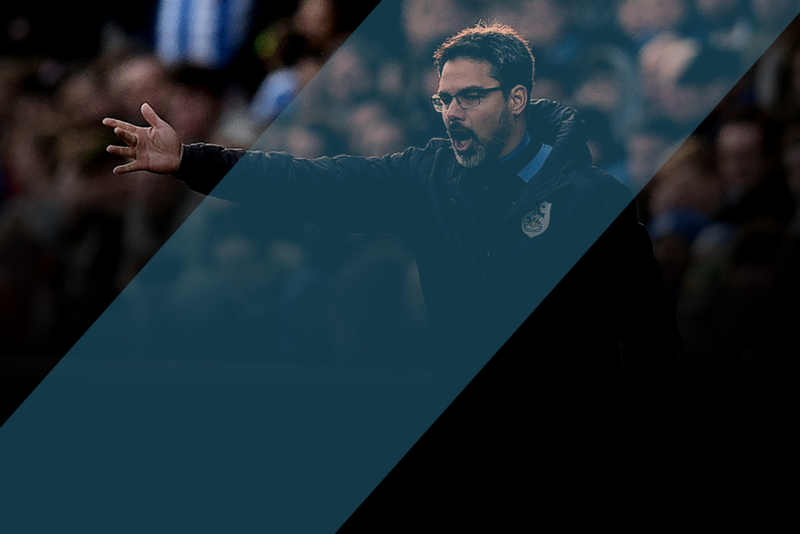 Pugh and Arter stand on the edge, but do not attack the ball from deep. What is clever is that when the corner taker starts his run up, Francis (1) moves out of the crowd into the space. 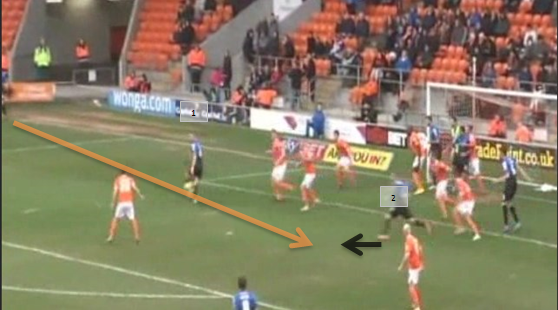 Blackpool are man-marking and thus, no-one is marking the space. As Francis (1) moves out, he is the closest player to the flight of the ball. 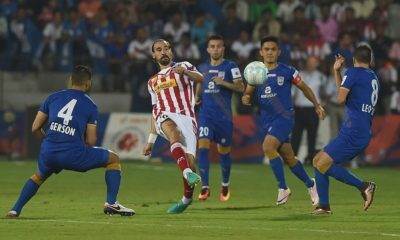 The corner taker deliberately gives the ball a flat trajectory to reduce the time the ball is in the air. Whilst Francis (1) has been make his move, the same movement occurs at the back post as Ritchie (2) leaves the crowd to go into that large space. The ball is played in and Francis (1) dummies it, which allows Ritchie to attack it. He gets the shot away only for it to get cleared off the line. Swapping positions, movement and Blackpool all over the place! In this image you will see the Francis (1), Wilson (2) and Pitman (3). 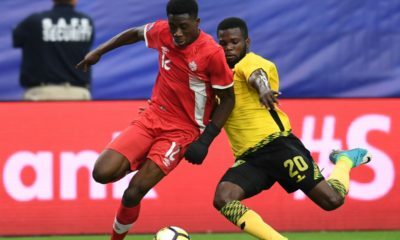 Francis has the ball and is positioning himself inside the defender. 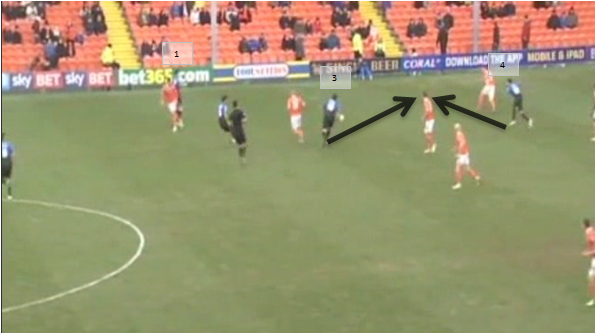 Pitman then runs around Francis to drag the Blackpool centre midfielder away from the edge of the Blackpool box. 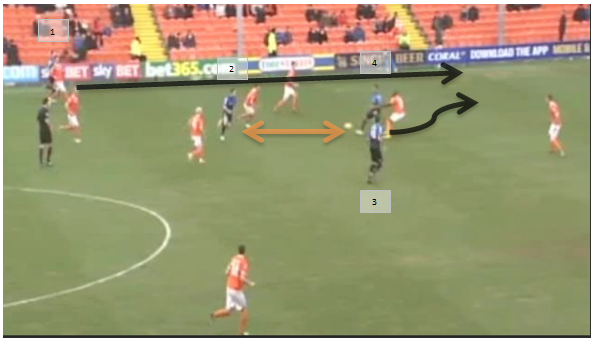 Francis (1) continues his run inside and finds Ritchie (4) in the space vacated by the centre midfielder of Blackpool. Ritchie (4) plays the ball wide to Pitman (3), who now holds the wing. The Great fluidity shown to swap the two of them is beautiful. Francis, the Bournemouth Right Back (1) continues his run further. Francis’ (1) run has vacated the same space again, which Ritchie (4) drifts into. 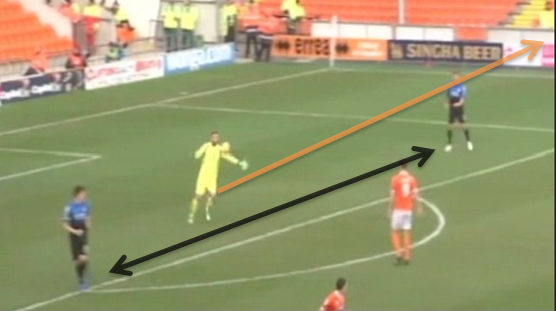 The Centre Back of Blackpool then has no option but to close him down. A beautiful dummy to shoot from Ritchie (4) turns the Centre Backs back, which then gives Ritchie (4) the shooting opportunity. They can’t always be perfect! Bournemouth were three nil up and cruising before Blackpool decided to press for the first time in the game. 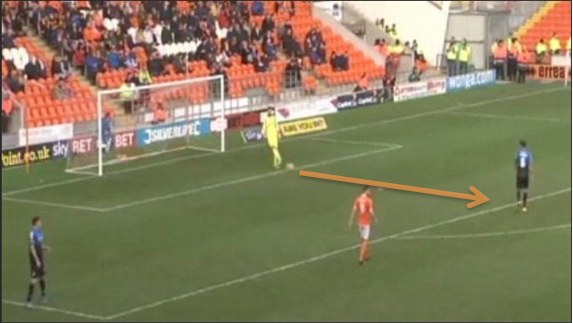 After several corners, Blackpool had an opportunity for a volley on the edge of the box to get a goal back. The shot was miss-hit and fell to Ritchie on the edge of his own box. He controlled with his head, then his knee. The problem here is that, because the Bournemouth players are so close and compact to each other, Ritchie (1) do not have an out ball. What he needs to do is clear it out of the danger zone. 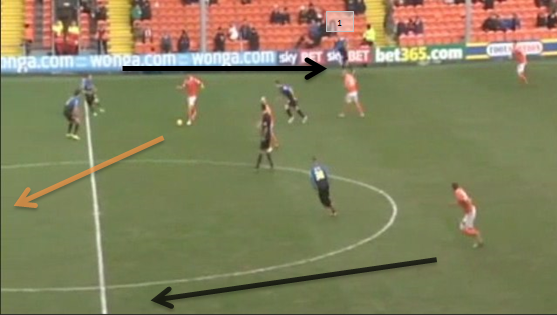 His focus is on possession and here is where Blackpool take advantage. They know he isn’t going to clear it, so they close ball possessor down. 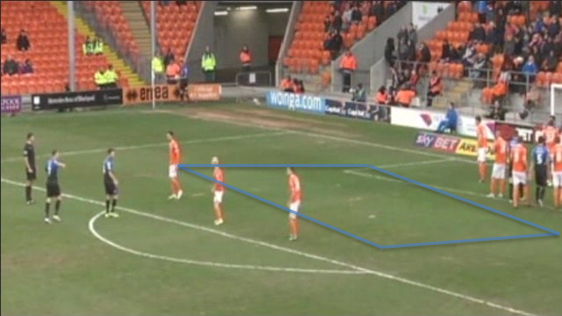 As this scenario occurred from several Blackpool corners, they have men in and around the box. Once they win it, there are many tangerine shirts ready to collect the ball. One bit of closing down followed by one cross and Blackpool have a goal back. 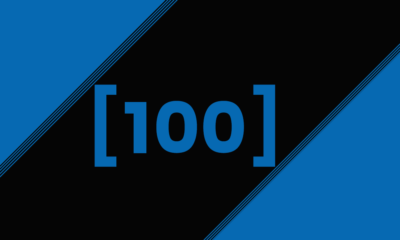 This is where I believe Bournemouth’s biggest weakness lies. I think due to their mentality to keep possession; they would rather take more risks than simply clear their lines. Bournemouth were truly devastating in attack. 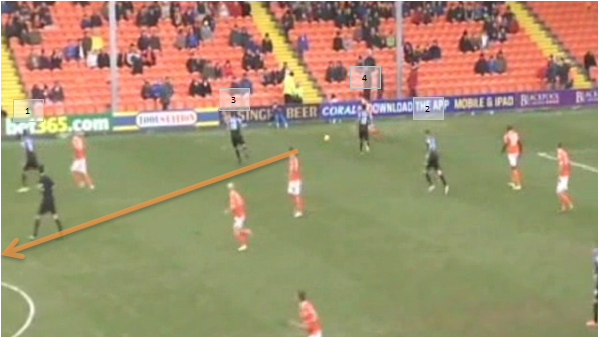 They scored 6 goals in the Blackpool game and conceded one, as shown in the section above. 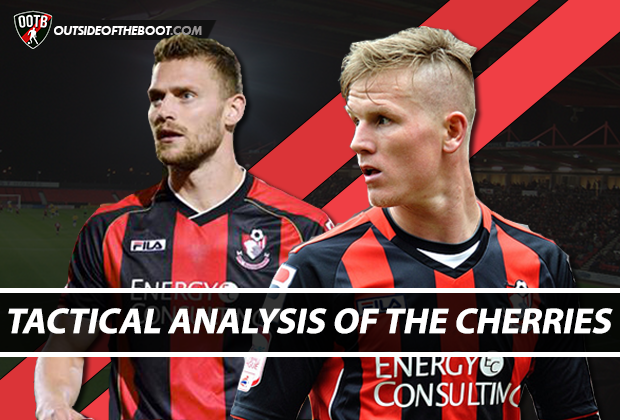 The Cherries had 63.8% of possession throughout the 90 minutes. Their passing was predominately short and played on the floor. 593 of 683 passes were short and 624 of 683 were on the ground. 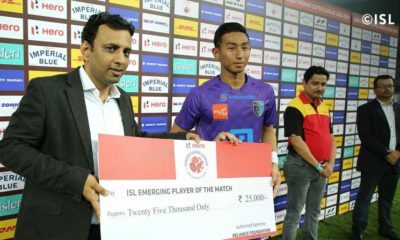 By having the wingers narrow and Pitman, the deep lying striker, playing so deep, the team were compact in the centre of the pitch, in range for intricate, short passing. The chart below shows the short ground passes played into fee in the final third for each team. 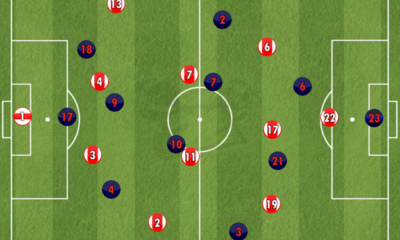 The Cherries dominated the “Zone 14” of the pitch. Bournemouth’s pressing was truly telling when you look at Blackpool’s pass success rate. They only completed 57% of their passes due to pressure that Bournemouth put on the backline and centre midfielders. The highest pass completion by any of Blackpool’s back four was 59%, left back Kennedy, and the lowest 42% by right back Foley. O’Keefe, who played in centre midfield for Blackpool, had a shockingly low 33% pass success rate. 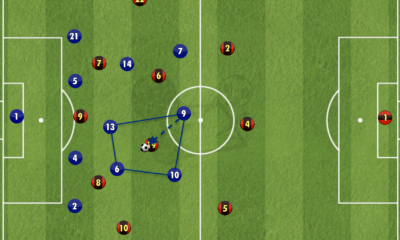 Throughout the game, Bournemouth’s high block was played to excellent efficiency. Each number on the chart above represents the % completion rate. Surman and Arter dominated the game, both having at least 80 completed passes and both with passing success rates in the 90%. In my opinion, Bournemouth are the best footballing side in the Championship since Gianfranco Zola’s Watford side reached the Playoffs in 2013 (and yes, I’m a Watford fan). Zola had a very similar ethos of keep possession at (nearly) all cost. The problem was, as highlighted above, they were not willing to concede possession on the edge of their own box, when really they should have cleared their lines. Bournemouth will get promoted because teams simply, as shown by this game, don’t know how to deal with the narrow wingers/wide midfields and a very deep lying striker. 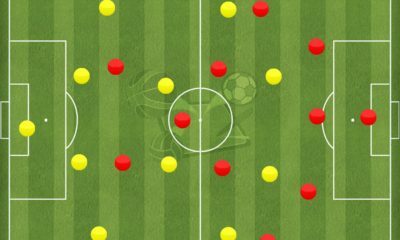 This method of play simply creates so many passing triangles that it would be hard for The Cherries to lose the ball. 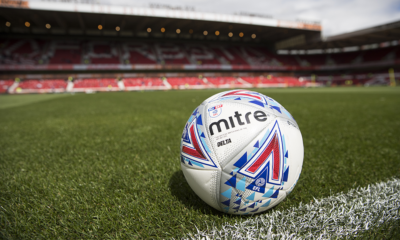 Good luck to the Cherries for the rest of the season and we look forward to you competing the big boys, even if you’re leaving Watford behind!